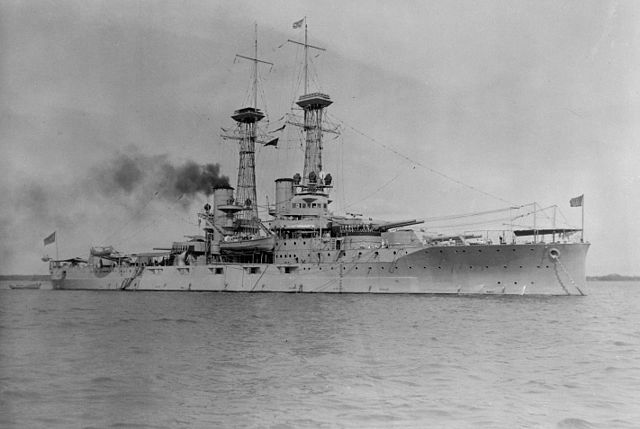 Dreadnought battleships of the Delaware class were launched in 1909 and completed in 1910, and can be seen as the first “true” dreadnoughts of the American Navy, since the preceding South Carolina were a bit of compromise between the old and new designs. They were in tonnage, dimensions, and especially speed, more in line with this type of modern battleship. 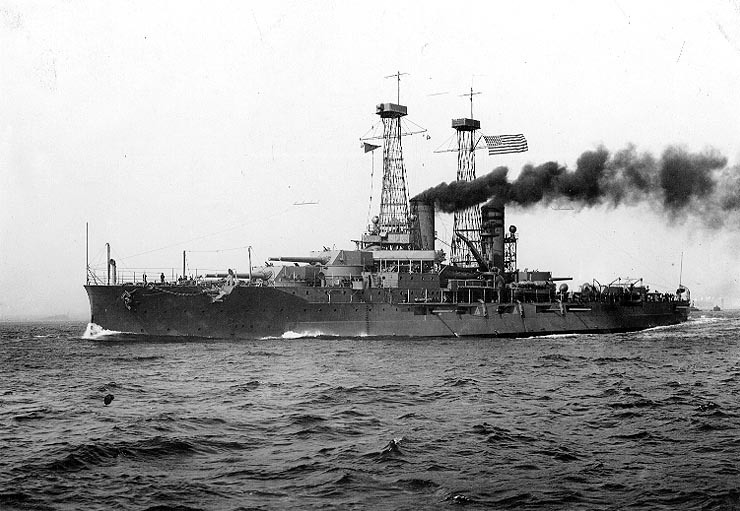 -The USS Delaware (BB-28) was laid down at Newport News Shipbuilding, 11 November 1907, launched 6 February 1909 commissioned 4 April 1910, and decommissioned on 10 November 1923, Broken up at Boston the next year. -The USS North Dakota (BB-29) was laid down 16 December 1907 at Fore River Shipyard, Quincy, launched 10 November 1908 and commissioned 11 April 1910. It was decommissioned 22 November 1923 and Broken up at Baltimore, 1931. 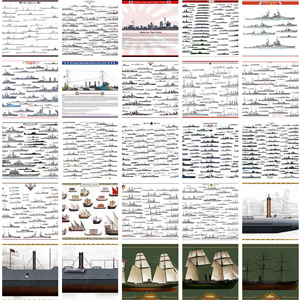 In 1908 indeed, the 16,000 long tons (16,257 t) limit imposed on capital ships by the United States Congress was waived, allowing new designs to be built (although still with a budget capped to 6 million USD). The Bureau of Construction and Repair undergone a serie of modifications and by 1909, the ships were the first in US naval history to exceed 20,000 long tons (20,321 t). 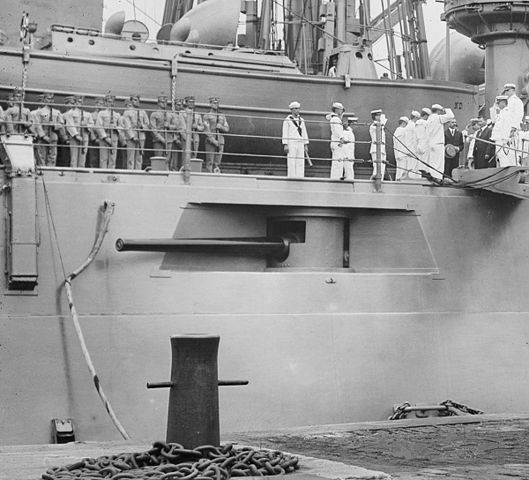 Outside a length allowing an extra pair of 12 in cannons (305 mm), the Delawares reintroduced a full-fledged medium-caliber weapon for anti-torpedo boat defense, another critic of the previous design. This secondary artillery however was of 5-inch (127 mm), less than 152 to 160 mm adopted by European navies, but the guns were faster, and will imposed themselves as a standard throughout the XXth century. 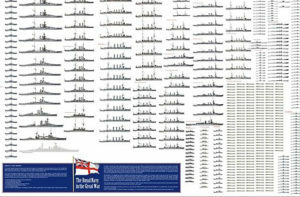 The Delawares were also capable of 21 kn (24 mph; 39 km/h) versus 18.5 kn (21 mph; 34 km/h) on the previous ships, more in line with modern dreadnoughts. At first drawn with classical simple masts, the latter were converted to their completion in cranes for lifeboats. Their “corbel” type masts were a recurring feature of American BBs until the 1940s. 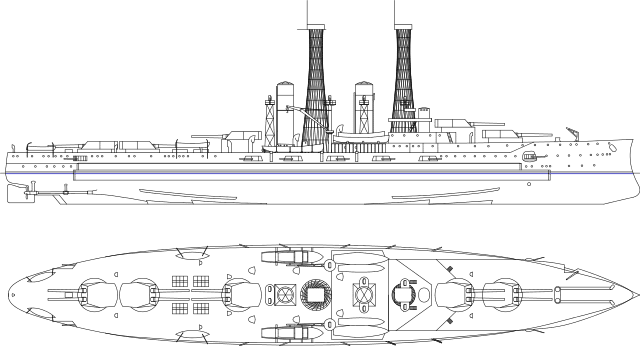 This was probably the less revolutionary of the three aspects: The armored belt ranged was 9 to 11 in (229 to 279 mm) thick, on the more important areas of the ship (from A turret to Z turret). Barbettes had between 8 and 10 in (203 and 254 mm) of armor. Main gun turrets base and “well” was armored with 4 to 10 in (102 and 254 mm). The front and rear sections of the main barbette received thinner armor to save weight. The gun turrets were 12 in (305 mm) thick, conning tower 11.5 in (292 mm) thick but deck armor was quite thin at 1.5 in (38 mm) but 2 in (51 mm) over the engines and ammo magazines. Indeed engagements were thought to be less than 10,000 yd (9,144 m). At such distances, high angles deck impacts would be rare. Long story short, North Dakota was fitted with steam turbines, whereas Delaware retained triple-expansion engines. US turbines the did not bring frank advantages in output or speed over triple-expansion (TE) systems. They were also much less fuel-efficient, a crucial flaw for the Pacific, as the US lacked an extended network of coaling stations, unlike Great Britain. 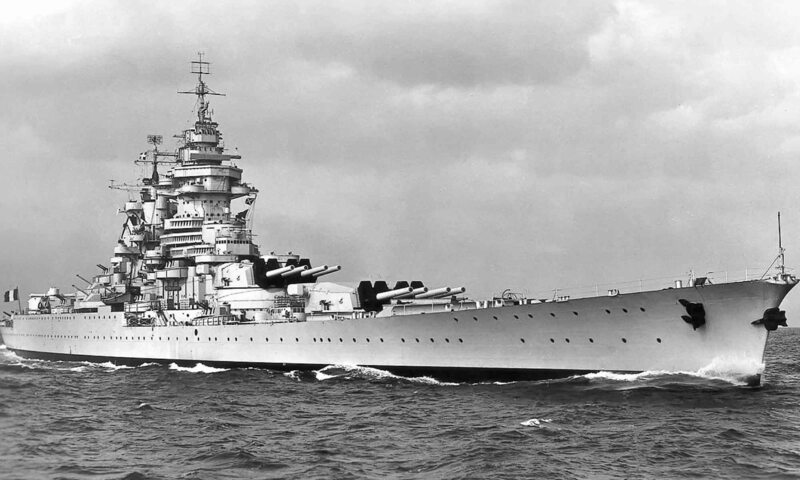 They also received two additional 305 mm pieces (one more turret), bringing the total to 10 as the British HMS Dreadnought, but crucially, all the turrets were in the centerline, allowing a better broadside, with all guns to bear, but at the cost of chase and retreat firepower. 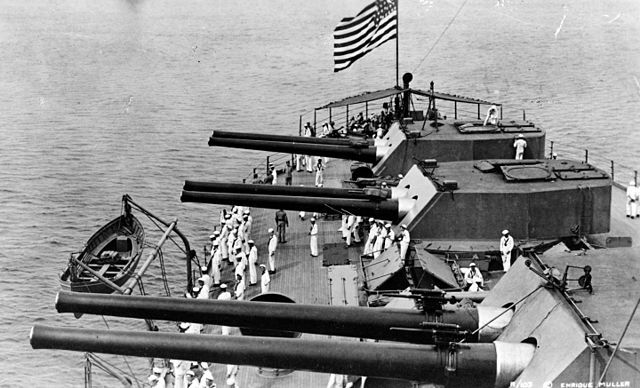 These 12-inch/45 caliber Mark 5 guns had a rate of fire of 2-3 rpm, with 870 lb (395 kg) shells, of AP or HE types declared obsolete by 1915. Propellant charge was 310 lb (141 kg) in silk bags, muzzle velocity was 2,700 ft/s (823 m/s). Like the previous class, the front artillery was mounted fore in a superfiring pair, while the rear turrets were disposed in such a way that one in-between was sacrificed and cannot fire in retreat but in high angle only, and with care, its blast knocking the Z turret each time. This center-line disposition was optimized for broadsides. 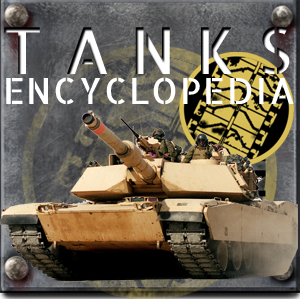 There was another design challenge imposed by the weight of the artillery, 437 long tons (444 t) per turret, imposing some hull stress management. This was partly solved by deepening the hull. However, they were also critics about their 5-inch/50 caliber Mark 6 barbettes, far too low, putting the efficiency of these secondary guns at the mercy of gales. In fact they were extremely wet at all times. These guns however compensated by a rate of fire of 6 to 8 rounds per minute. Three types of ammo were in store: “light” AP shell of 50 lb, “heavy” AP round of 60 lb and the common Mark 15 shell of 50 lb. The latter had a muzzle velocity of 3,000 ft/s (914 m/s), vs 2,700 ft/s (823 m/s) for the heavy AP ones. The Bliss-Leavitt 21-inch Mark 3 Model 1 torpedo were installed underwater on both sides, and had an explosive charge of 210 lb (95 kg) of TNT, and could achieve a range of 9,000 yd (8,230 m) at 27 kn (31 mph; 50 km/h). Later in wartime, an anti-aircraft artillery was installed, two 3-inch/50 caliber anti-aircraft (AA) guns in Mark 11 mounts in 1917. Maximum ceiling 30,400 ft (9,266 m) at 85 degrees. Prior to the war, the Delaware shown it could run at full speed for 24h, and endure the stress of it during trials, the first American warship to do so. 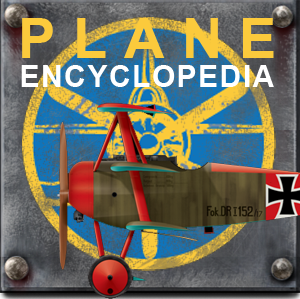 She spend her career in fleet exercises with the US Atlantic Fleet, and did trips to Europe, South America, the Caribbeans, taking part in the Second battle of Vera Cruz in April–May 1914. 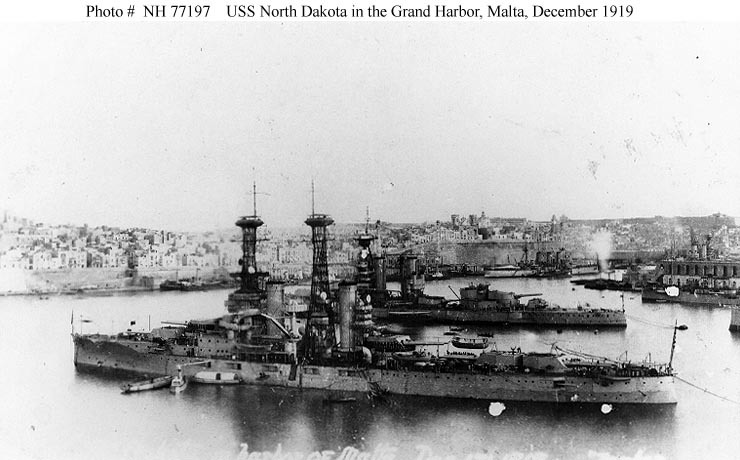 The North Dakota also served with the Atlantic Fleet and her sister-ship, paid a visit to Europe in 1910, took part in the invasion of Vera Cruz in 1914. 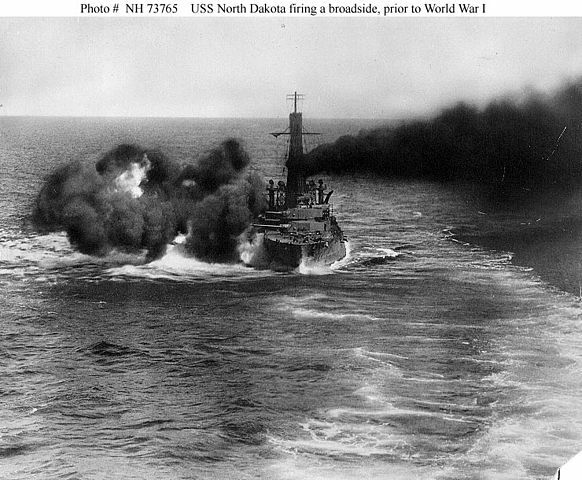 Both ships served in the Atlantic during the war, however the North Dakota remained stateside, barely leaving the coastal waters. This was due probably to its somewhat unreliable turbines and ordered by rear admiral Hugh Rodman, the naval commander of the American expeditionary force. She started in 1917 a new mission of training gunners and naval engineers. 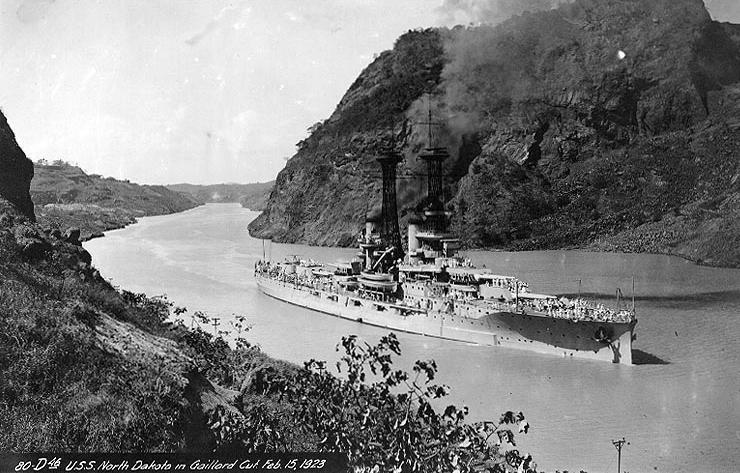 When the war started for the US in April 1917, USS Delaware trained on the eastern coast before eventually join the US Navy’s Battleship Division Nine deployed in Europe, under the command of Rear Admiral Hugh Rodman. She then was assigned on 7 December to the 6th Battle Squadron of the Grand Fleet. She eventually returned to the US on July 1918. The Delaware made only two more cruises, in 1922 and 1923 (a long trio to Europe, and up to Gibraltar) before returning and being decommissioned and disarmed in Boston Navy Yard in November. North Dakota made a second trip to Europe, mostly in the Mediterranean Sea. She was tasked with the return of the remains of the Italian ambassador, Vincenzo Macchi di Cellere (died 20 October 1919 in Washington, DC). She then returned and participated in aerial bombing demonstrations off the Virginia Capes in 1921. In 1923, she made a third trip to Europe with midshipmen from the Naval Academy aboard, stopping in Spain, Scotland, and Scandinavia. But like her sistership she was relegated to the surplus naval forces targeted by the Washington Naval Treaty. Unlike the Delaware after being disarmed in 1923 she was converted into a target ship, redesignated as “unclassified”, and used as a target until 1931, scrapped afterwards. -Propulsion: 12 Babcock et Wilcox boilers, 2 screws, 2 Curtis turbines, 25 000 hp, 21 knots. -Armour: Belt, barbettes 250 mm, turrets, conning tower 305 mm. -Armement: 10 x 12in (305 mm) (5×2), 14 x 5in (127 mm), 2 TT (side, sub) 21 (533 mm). 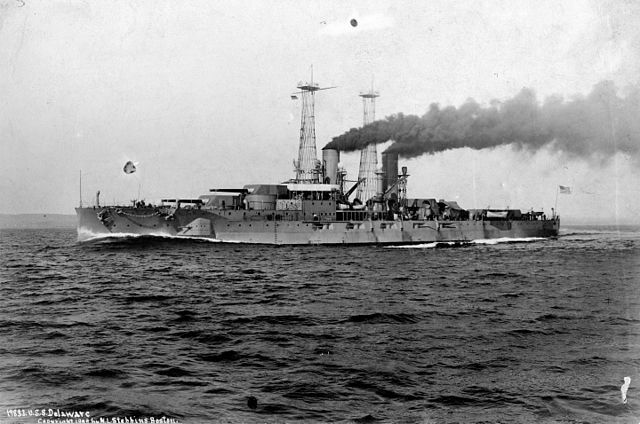 USS Delaware in full speed trials after completion. She sustained 24h at 21 knots without any problems with its TE engines.